A woman comes to the police station in Eastvale and asks to talk to her old neighbor, Detective Chief Inspector Alan Banks. Unfortunately Banks is on vacation to recover after several demanding incidents. His closest colleague, Annie Cabbot, talks to the upset woman. The woman tells Annie that she has found a gun among her daughter’s belongings. The task force is called in, but the raid goes wrong and the dad in the family gets shot. The girl with the gun, Erin, normally lives with Alan’s daughter Tracy, and Erin stole the gun from her boyfriend after a heated argument. When Tracy hears about the raid she hurries to warn Erin’s very attractive boyfriend Jeff that the police most likely are on their way. Together they leave town and hide in her dad’s – Alan Bank’s – cabin. The poor naive girl soon realizes that looks are not everything, and that evil can have a beautiful face. I was disappointed in Peter Robinson’s last novel (All the Colors of Darkness) which felt like a sloppy attempt to meet the audience’s longing for a new novel about Banks and Cabbot. Unfortunately Bad Boy started in the same boring way. It took me a loooooong time to get through the first 100 pages, but when I finally got to the point where Banks return from his vacation (which was a useless part of the storyline) the story picks up. Robinson’s series about the police in the made-up town Eastvale is definitely dependent on its leading man – Alan Banks. 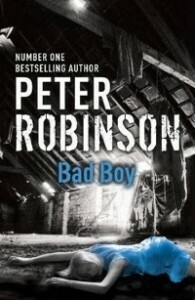 Bad Boy is an ok novel, but Robinson has a long way to go to reach his former greatness. I look forward to next novel and hope for a success!